Puzzles are great for helping children to develop much needed problem solving skills and memory. From toddlers to teens, there are so many wonderful puzzles that your kids can use to help them to develop their brains. Of course, I like the DIY way of doing everything, so I thought that I would share with you my favorite 15 easy to DIY kids puzzles that are just as much fun to make as they are for your kids to play with. Puzzles help little ones to learn shapes and forms as well as space. Toddlers can use puzzles to help develop their fine motor skills and learn coordination. Even teens can use puzzles to help them to learn patience and determination. These DIY puzzles are all great for toddlers and preschoolers and some of them will even work for your preteens and teenagers. Kids can even help to make most of these. If you love DIY toys, these are perfect and if you do happen to love making toys for your kids, you should be sure to take a look at these 30 DIY rustic toys that your kids are going to love. Most of these DIY puzzles can be made with things that you probably already have on hand. Some of them require craft supplies and some use upcycled materials like empty cereal boxes. 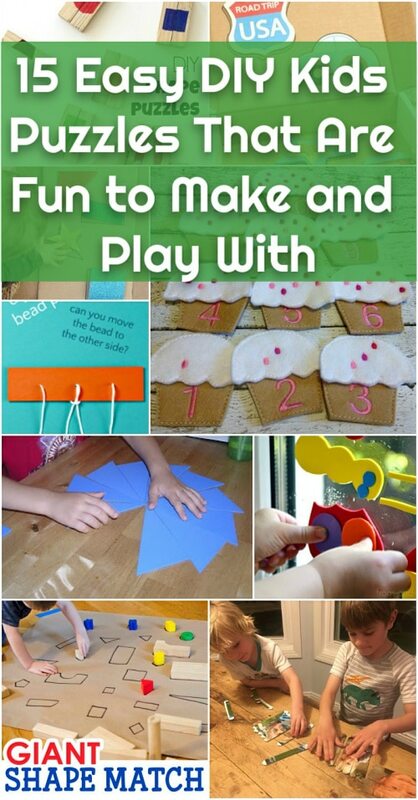 They are all super easy to make and will definitely help your little ones to develop those much needed skills. Your kids are going to adore all of these DIY puzzles and they make wonderful gifts for upcoming birthdays for your kids or anyone’s kids. I hope you enjoy making and playing with these DIY puzzles and I hope you will also check out these 30 fun and educational toys for babies, as well. This little puzzle is simple to put together and it is great for helping your child with problem solving skills. 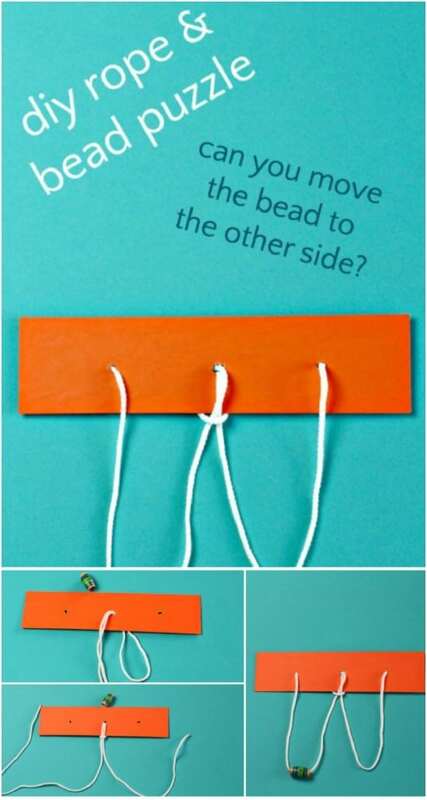 It’s a classic string and bead puzzle – they have to move the bead from one string to the next. This is a great DIY puzzle for toddlers and preschoolers. To make it, you just need a small strip of cardboard, some string, something to punch a hole with, a wooden or plastic bead and scissors. Matching games are great for helping toddlers and preschoolers to develop their memory skills. 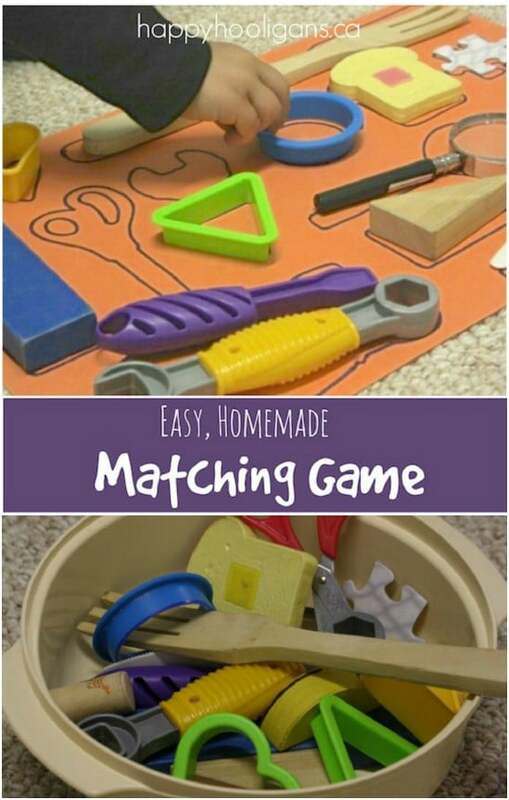 This DIY matching game is super easy to make and you don’t need anything aside from something to trace and something to trace it on. You can use household items to make the shapes and then cut them out of cardstock, heavy construction paper or even craft foam. Your little ones match the shapes that they pick out with the traced picture on the paper. 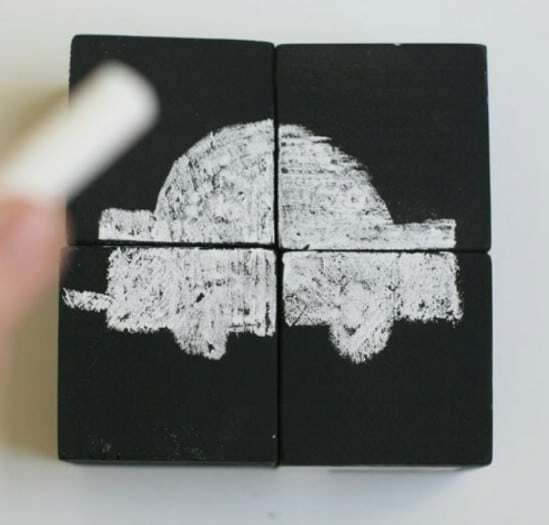 I love a good DIY chalkboard paint project and this easy chalkboard block puzzle is a great one. You need some wooden blocks for this one, along with chalkboard paint and chalk. You can change the puzzle every time the kids play with it by just drawing on a new picture. This is a great DIY puzzle for toddlers to help them to learn how to work a puzzle and it makes a great gift in a little basket with some colored chalk. DIY felt puzzles are so easy to make. You just need felt and a few images that you can transfer onto the felt. You can sew or glue those images on and then cut them in half so that your toddler has to match up the two pieces. 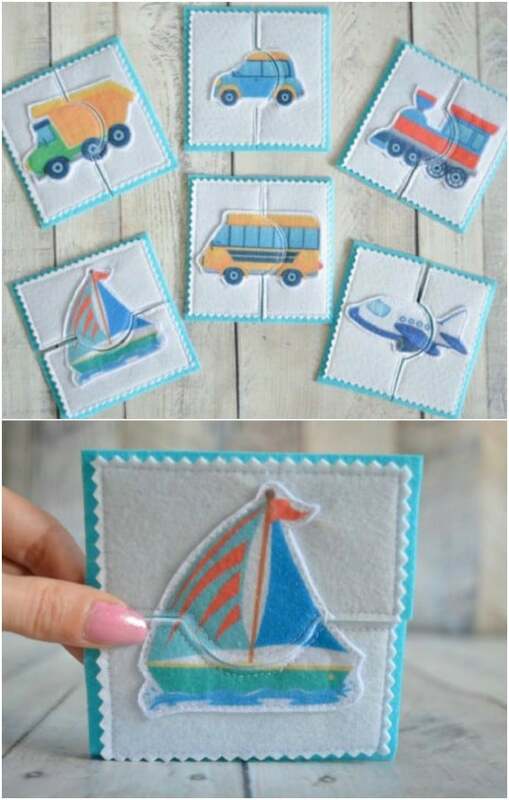 You could do these little felt puzzles with any number of images and they are great for helping toddlers to develop their memory skills. I found a set of nice ones on Etsy for around $20, or you could easily do these yourself. I love good ideas for things that my kids can do when it’s rainy out…or too hot to get outside…or snowing. You get the picture. 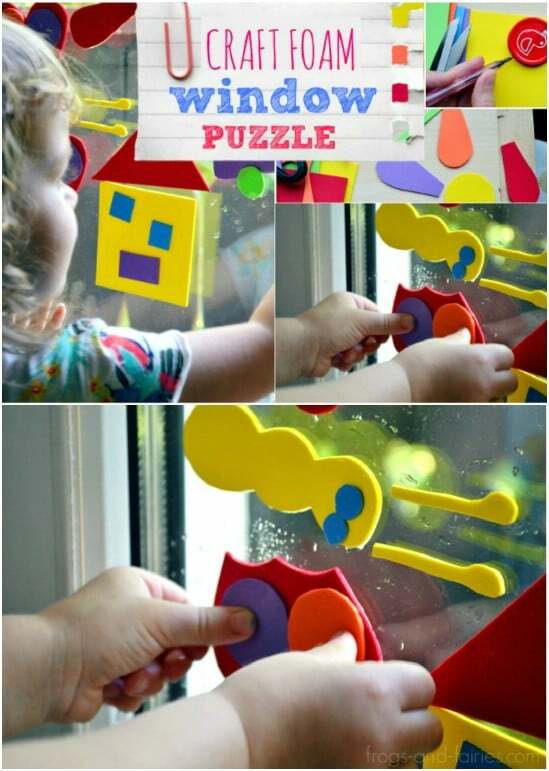 This DIY craft foam window puzzle is great for when they can’t get outside but want something fun to do. This is so easy to make and really cheap, too. When you get craft foam wet, it will stick to glass for quite a while and give them something really fun and educational to do. Montessori is a well known educational platform that many homeschooling parents use. If you are familiar with the Montessori method, you know how trusted it is for education. Even if you don’t, you should familiarize yourself with these great Montessori triangles that can help to teach your little ones about shapes and geometry in general. These are super easy to make and kids find them so much fun to play with. If you’re like me, you throw out at least two cereal boxes every week. My kids go through a lot of cereal. Instead of throwing out those boxes, use them to create these adorable upcycled cereal box puzzles. The only things that you need for this one are empty cereal boxes and scissors. 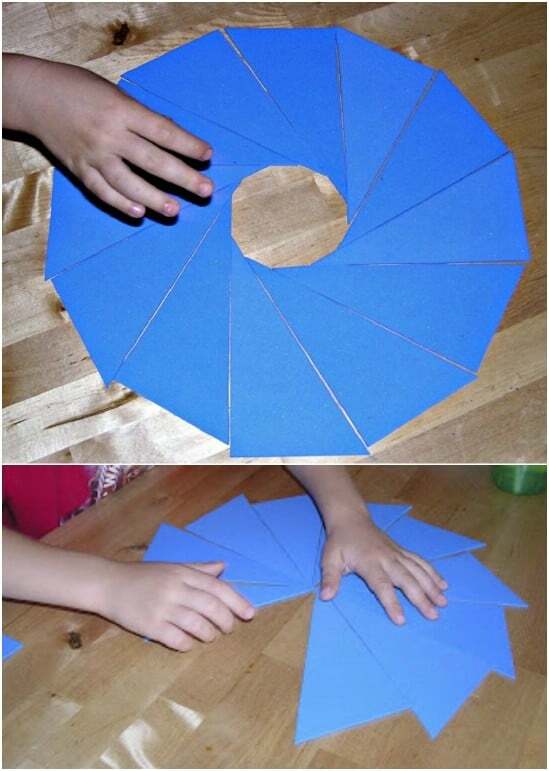 You can even let your kids help you to create the shapes that they want to use. What a wonderful way to repurpose empty cereal boxes and keep them out of the trash! For this easy DIY floor puzzle, you just need something to mark off space. 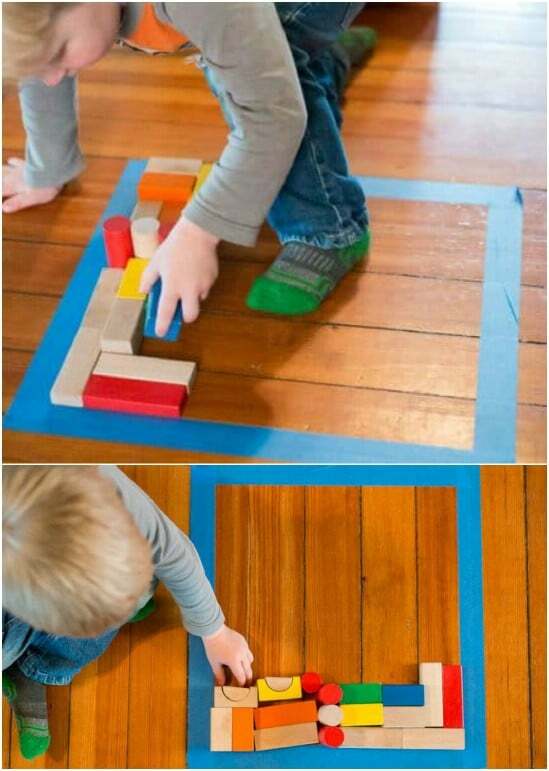 Your kids can use the blocks that they already have for play. The gist of this puzzle is to teach them about area – and it helps to teach them about personal space, as well. You can use any number of wooden or plastic blocks for this one. You just need something to mark off their space before they begin. Talk about an easy DIY puzzle! This one is super simple to create and you can make it entirely out of repurposed cardboard. You just have to create your shapes and then create shapes that are cut out for your kids to match. It’s a great learning opportunity for toddlers and babies – babies that are old enough not to put the pieces in their mouths, that is. Use glitter or colorful paint to make it even more entertaining for your little ones. Shape sorting is a great way for toddlers to learn shapes, colors and hand eye coordination. 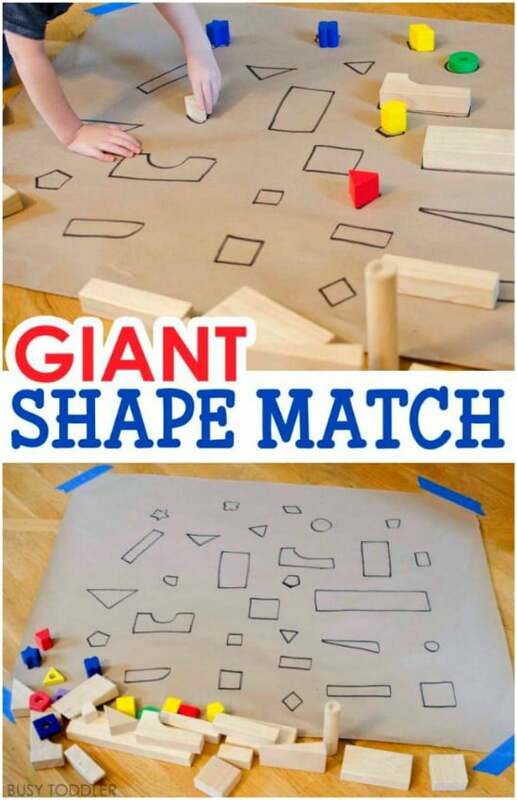 This giant DIY shape sorting puzzle is so easy to make and your little ones are going to have hours of fun playing with it. You can do this one with existing wooden blocks or make your own wooden blocks if you have the tools. The base can be made from plywood or even upcycled cardboard if that’s what you have on hand. 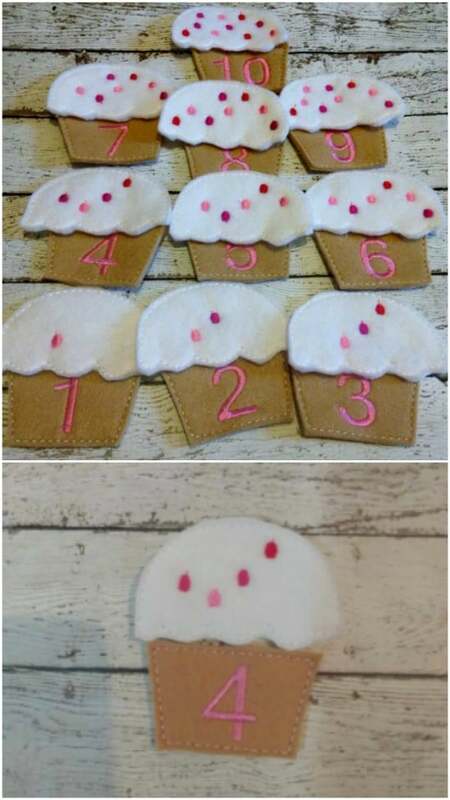 I found this adorable little math cupcake puzzle set on Etsy. You can get it for under $15, or make this one yourself. It’s an easy DIY with felt and your toddlers and preschoolers are going to adore playing with this one. The gist is to match the number of sprinkles on the cupcakes to the numbers on the cones. How cute is that? You can embroider the numbers and sprinkles or even draw them on with permanent markers. Do your kids save all of their birthday and holiday cards from the grandparents? 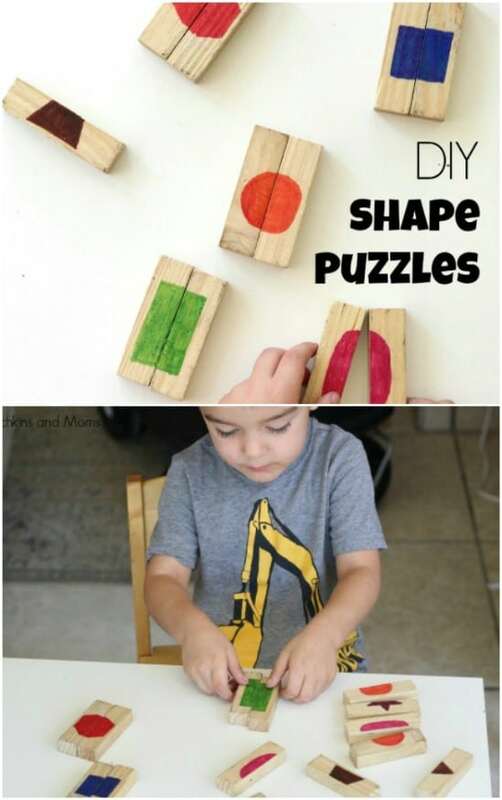 If they do, you have a golden opportunity to create some fun DIY puzzles for them. If you don’t have any greeting cards on hand that you can repurpose into puzzles, you can buy them at the Dollar Store for about 50 cents each. Or, you can often find boxes of holiday cards on clearance right after the holidays and they are super cheap. 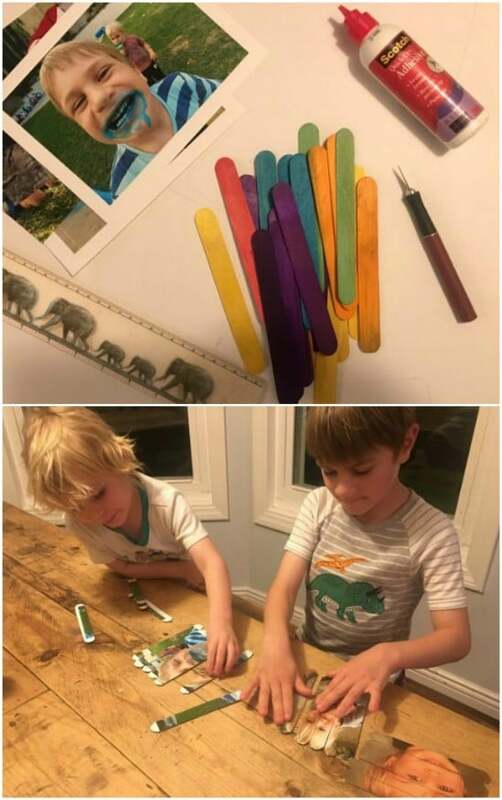 Popsicle stick crafts are my favorites – and my kids’ favorites, too. There are just so many things that you can do with craft sticks, like these DIY craft stick photo puzzles. These are so super easy and they are perfect for helping your toddler to master the art of puzzles. You just need craft sticks, some printed off photos and some adhesive, like Mod Podge, to make these. You’re going to love how easy these DIY wooden shape puzzles are to make, almost as much as your toddlers will love playing with them. You can make these from Jenga blocks, and you can get cheap knockoff Jenga blocks at the Dollar Store for around $3 for a box. Just use those blocks to create your own DIY wooden shape puzzles. Aside from the blocks, you just need some colorful permanent markers for this one. 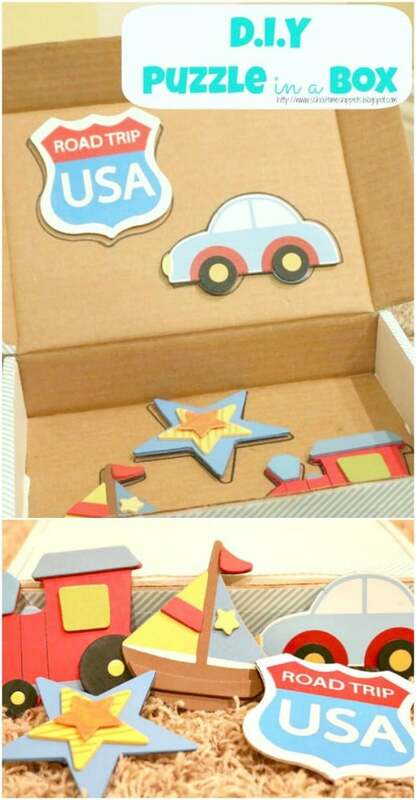 This DIY wooden puzzle in a box is a great activity for road trips and your toddlers are going to love it. You need an empty box for this one, as well as some precut wooden shapes. Check the Dollar Store or your favorite craft store. You can find all sorts of shapes and then you just trace your shapes onto the box for matching. 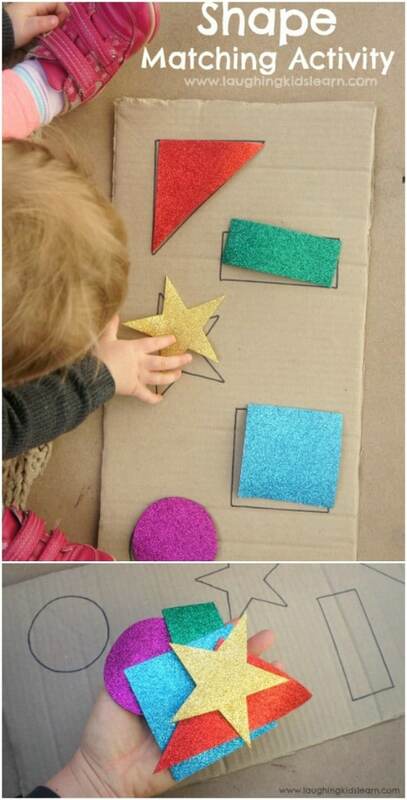 You can decorate your shapes, too and kids will love this part of making their puzzle in a box.